Motorhome, camper, recreational vehicle – whatever you call them, RVs are popular. They are also a common sight in Florida, where people use them for camping and traveling to many of the state’s tourist attractions. Many retired couples even use an RV as their primary residence. Although they range in size and structure, most RVs are oversized vehicles. In an accident, they can cause serious injuries. If you have been injured in a motorhome accident, a Boca Raton personal injury lawyer can help. Americans are known for loving the freedom of the open road. Nothing captures this trait quite like an RV. From folding campers to luxurious homes on wheels, RVs make it possible to feel right at home, even when you’re on the open road. 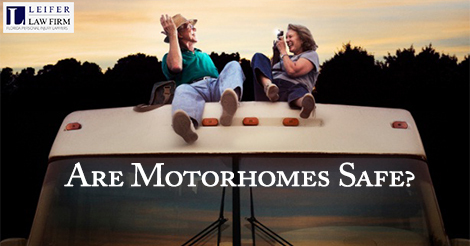 As the baby boomer generation enters retirement, RV industry experts anticipate motorhome sales will continue to grow. Although they are often just as large and heavy as tractor-trailers, RVs are not subject to the same safety regulations as 18-wheelers. In Florida, RV owners don’t need any special kind of driver’s license to drive an RV. In fact, state law exempts RV drivers from obtaining a commercial driver’s license. Like any large vehicle, RVs can be unwieldy and difficult to maneuver. An RV crash can be just as deadly as a large truck collision. They also have several large blind spots similar to those on semi-trucks. A 2003 study by the Federal Motor Carrier Safety Administration (FMCSA) reported 70,000 RV accidents that year, with many accidents resulting in catastrophic injuries. Remember the No-Zones: Like commercial tractor-trailers, RVs have large blind spots – sometimes called “no-zones” because crashes are more likely to occur in these areas. In a typical motorhome, the no-zones are located on both sides, up to 200 feet in the rear, and up to 25 feet in front of the vehicle. Give Yourself Extra Time to Stop: Because RVs are much heavier than standard vehicles, they need extra time to come to a complete stop. To lower the risk of a rear-end collision, also keep plenty of space between your RV and cars traveling ahead. Always Buckle Up: Because RVs are designed to be a home away from home, it’s tempting to roam around the cabin or take a nap while the RV is in motion. In a crash or a sudden stop, however, objects can shift and fly around the vehicle’s interior. In the most tragic cases, a person is launched through the cabin and seriously injured or killed. Distribute Weight Properly: As with any tall vehicle, RVs have a much higher rollover risk than passenger cars. Distributing weight evenly is one way to lower this risk. The FMCSA advises RV owners to distribute weight closer to the ground and equally on either side of the vehicle. If you’re taking your RV on a weekend jaunt or a cross-country trip, make sure you perform regular maintenance before hitting the road. Check your RV’s tire pressure and fluids prior to your trip. If you have been injured in an RV accident or any kind of motor vehicle accident, a Boca Raton personal injury lawyer can help you determine the next steps in your case. Don’t wait to speak to a lawyer about your injuries.